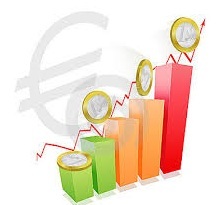 EUR/USD - Another leg higher? 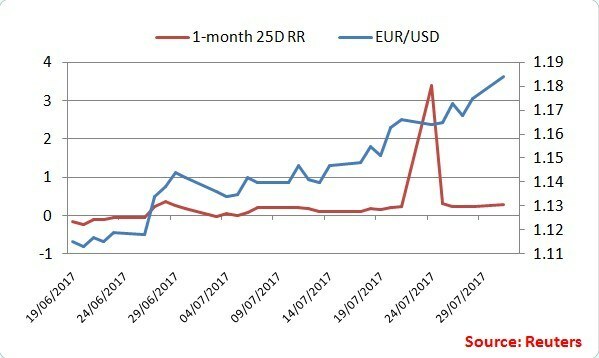 EUR/USD jumped to a high of 1.1846 on Monday on the back of a broad based USD sell-off even though the 10-year US Treasury yield rose to 2.30% and the US-German 10-yr yield spread improved to 1.76 from the previous day’s print of 1.74. The downward sloping monthly 50-MA is stationed at 1.1870. The monthly 50-MA was last seen in action in August 2014, when it offered support around 1.3390 levels. The EUR has been treated as a growth/risk-on currency this year. The preliminary Q2 GDP report due today at 9:00 GMT is expected to show the Eurozone economy expanded 0.6% q/q and 2.1% in annualised terms. A better-than-expected GDP figure would boost the EUR’s appeal as growth currency and push EUR/USD above the monthly 50-MA level of 1.1870. Further gains depend on the quality of the US personal spending and income report due at 18:00 GMT. Yesterday’s rally in the spot was accompanied by a minor uptick in the 25-delta risk reversal from 0.25 to 0.30. However, on a larger scheme of things, risk reversal remains flat lined, which indicates the rally in the EUR could be overdone. The spot was last seen trading around 1.1825. At least two consecutive daily closes above 1.1870 [monthly 50-MA] would open doors for a sustained rally to 1.20 and 1.2042 [July 2012 low]. On the downside, support is seen at 1.1765 [5-DMA] and 1.1692 [10-DMA]. Both the averages are sloping upwards hence dips could be short lived. Under 10-DMA, a major support is seen at 1.1613 [July 26 low].